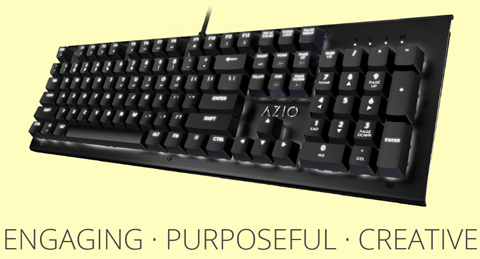 The Azio MK HUE keyboard is one-of-a-kind in style and ease of use. It is a fun, minimalist mechanical keyboard without all the unnecessary bells and whistles. Sporting a colorful anodized aluminum body, elegant white backlight, and Brown mechanical keys, as well as advanced features such as Macro Keys, N-key rollover and FN-Modifier hotkeys, the MK HUE is a dream come true for all typists. Color represents character, mood, and individuality. 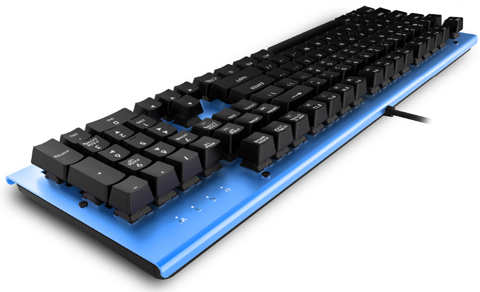 The Azio MK HUE keyboard comes in red, blue, and black. Make your statement by choosing the color that represents you. The MK HUE illuminates a contemporary while backlight, accentuating elegance to the colorful body of choice. Experience precise travel distance and tactile feedback with every key. Robust aluminum top-plate is beautifully anodized to the color that complements you. Increase productivity by assigning your most commonly used words, letters, or functions to the five programmable macro keys. Increase efficiency with FN-Modifier hotkeys for quick access to commonly used multimedia, productivity, and internet functions. Advanced N-key rollover ensures all your keystrokes are executed no matter how fast you type or how many keys are simultaneously pressed. 1.50" x 17.60" x 5.80"